I live in Virginia, not close to Charlottesville. I am never going to pretend that I can see all sides of this issue, but I am not going to use rhetoric about hate or Nazis. I am going to do what I am good at and use history. I am going to limit my scope to this specific statue, however, most of the Confederate Statues in question fall under this category. This is the statue of Robert E Lee that everyone is protesting over. This statue stands in the middle of Emancipation Park in Charlottesville, VA. Until 2017 this park was known as Lee Park. The renaming of the park and the removal of the statue were to have come at the same time, and set off the 2017 Unite the Right Rally. Emancipation Park (Lee Park) was created in 1917 by Paul Goodloe McIntire as a place to put his statues. McIntire was a philathropist who gave A LOT of money to the Charlottesville area, mostly to the University of Virginia where he endowed the arts, economics and built a lot of buildings. But what we are talking about are the statues he commissioned. Paul Goodloe McIntire commissioned: Thomas Jonathan Jackson Sculpture, Robert Edward Lee Sculpture, and the Meriwether Lewis and William Clark Sculpture. He then donated the land around Charlottesville and created the parks around the statues. The Robert E Lee statue was commissioned in 1917 and was completed in 1924, after the death of the original artist. What is interesting to think about is that the American Civil War ended in 1865, and it had been over 50 years since the war’s ending. So why was the statue created at this point? The Ku Klux Klan had reformed in 1915. This second iteration of the Klan peaked in the United States at anywhere between 3 and 6 million members. We have no way of knowing how many Klansmen there were post reconstruction but the current Klan in America today has between 5 and 8 thousand members. So, this statue was built at a time when the Klan had a large amount of support in the south, would have supported any symbol of the Confederacy. 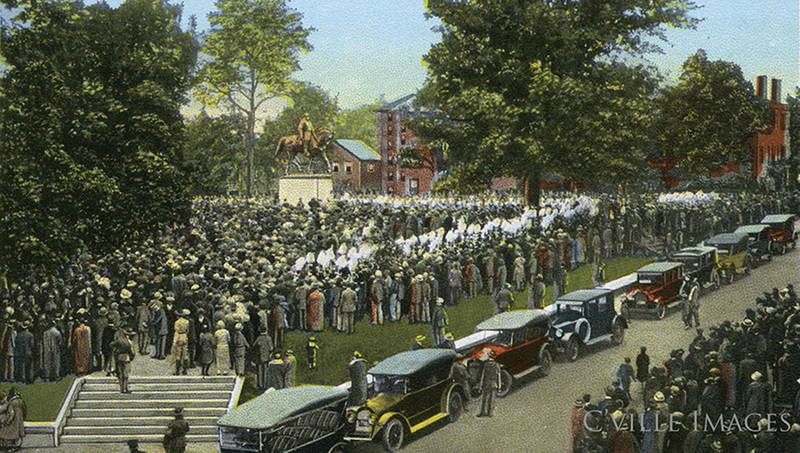 When the park and the statue were installed the Confederate Veterans, Sons of Confederate Veterans, and Daughter of the Confederacy were all invited. The city of Charlottesville says that the statue of Lee was not erected as a Civil War monument, which is one of the reasons it can be torn down. What also may be interesting to note, McIntire donated the land for two white only parks (McIntire and Belmont Parks) and a blacks only park (Washington Park). This does not in any way show McIntire to be a White Supremacist or anything of that nature, he was a product of his times, and the laws of his times. Donating a park for black children was seen as a sign of good faith at the time. Lee himself would not have wanted to see himself commemorated in stone, he wanted the sores of war closed. We live in a time where it feels as though the thought police are out to get us, where we must be politically correct or we will loose our jobs or livelihoods. But what other country has monuments to the generals of an insurrection? These statues were not erected directly after the war as a monument in the 1870s or 1880s. This statue was erected at a time when the Klan had power and were trying to dominate and scare people of color, Jews and Catholics. This statue is a symbol of history, but not the sort of history we should be celebrating. Tear down this statue and others like it, and study it where it belongs, in the history books.